Jacinda Arden, New Zealand’s Prime Minister, a lioness leader, a woman, demonstrated to all her male counterparts around the globe what real leadership is: compassion, sympathy, love, clarity, decisiveness, above all integrity and honest courage – by calling spade a SPADE! She has managed to grab the bull by the horn from one of the most horrific acts of violence perpetrated against innocent civilians, at their most vulnerable moment, in the house of worship and have single-handily set the narrative for defining terrorism from here onward. That is, it is faithless, and colour blind. Ms. Arden has raised the bar for the world leaders on tackling terrorism so high, that it would almost be impossible for anyone to overcome. This is precisely what was needed to confront the menace which has engaged the much of the world for the past two decades – chasing a loosely constructed phantom enemy, which was, up until she tackled it, after the massacre in Christchurch, New Zealand, was limited to a very narrow restricted and biased profile, brown, Middle-Eastern, Muslim male. NO MORE! The attack on Muslim worshippers at a mosque in Christchurch, New Zealand, during their weekly sabbath on Friday afternoon last week was not only the darkest moment for New Zealand as she claimed. It was indeed a darkest moment for humanity in recent history. 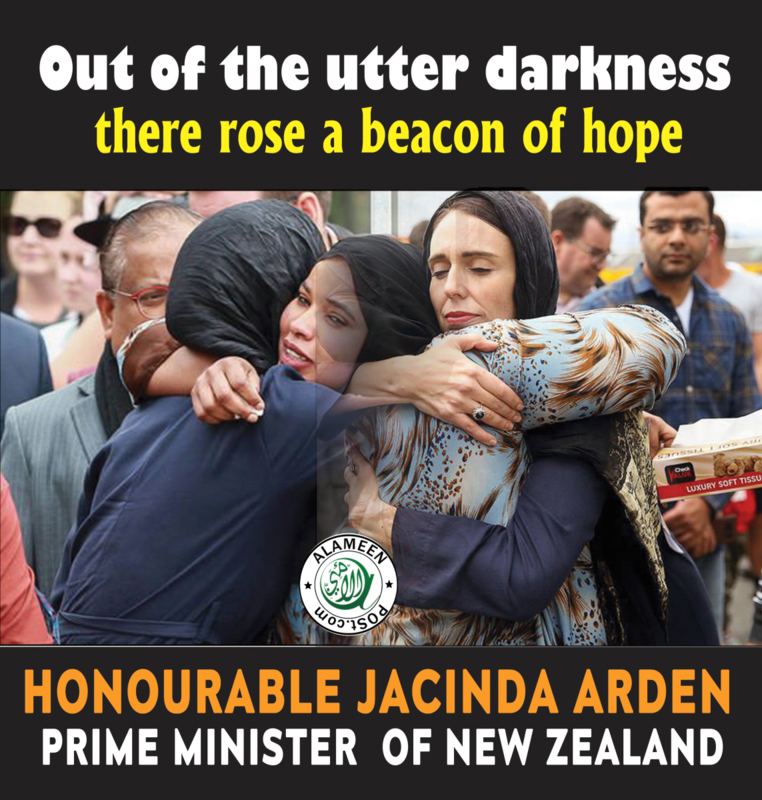 And out of this utter darkness there rose a beacon of hope whose name is Honourable, Jacinda Arden, Prime Minister of New Zealand. Who is Jacinda Arden. Well New Zealander’s were damn right to get caught up in “Jacinda-Mania” back in 2017 when they elected her, at the age of 38, New Zealand’s youngest Prime Minister in 150 years and also the worlds youngest Prime Minister. She gave birth in office and brought her infant to United Nation’s General Assembly meeting. While many questioned her abilities, criticized and rejected her antics as show and gimmickry. Oh well, past week, she proved to all her critics wrong. She proved, she has more substance than all male leaders, male politicians, male news anchors, and news editors in the western hemisphere combined. She proved all her critics that she is a rock solid and full of empathy, which most male leaders, politician, news anchor, and editors clearly lacks. In a male dominated society, as cut throat as world politics, a woman constantly needs to prove she has some extraordinary strength hidden deeply inside her, which her male counterparts don’t. She needs to prove that she is tough. she needs to constantly prove she can walk shoulder to shoulder with other world leaders and compete on an international level. Oh well, she just proved it, that her male counterparts may have been made of steel – but she is made of titanium – a gold plated one at that. She has been at the forefront of this most horrific event which she describes it as New Zealand’s darkest day. Anyone watching the media coverage initially would think she is some police’s or PM’s spokesperson. Much of the world did not realize that she was not just some spokesperson, rather she was the real deal, New Zealand’s PM. She promised to swiftly change the Gun laws, and as of now the legislative process has already begun to achieve just that. She did not differentiate among her citizens, regardless of their citizenship status – “They are Us!” – she proclaimed. By treating this horrific incident as someone had attacked her kith and kin, she now become the Mother of New Zealand. Not only she announced that her government would be responsible for victims’ funerals, she extended unending financial assistance to the victims’ families. She headed the delegation of all political stripes along with her and stood shoulder to shoulder with the Muslim community inside a mosque in their most desperate hours. “Sympathy and Love” when is the last time we have heard such words come out of a leader’s mouth? Hardly ever. In this world where politicians such as Donald Trump, Stephen Harper, and Narendra Modi – stoking nationalist votes – try to score points with their electorates by championing bigotry, to increase their chances of re-election. She has demonstrated a contrast between choices the current stock of leaders have. She has rejected what most male dominated politicians have chosen, to champion bigotry as a tool to guarantee certain percentage of the vote bank, and their re-election chances. It is refreshing to see a politician in the world still believes in most basic ideas of attracting humans – win their hearts and minds – by championing “Sympathy and Love!” and thereby inspiring many around the world with her message of inclusiveness and diversity. It is our view that Jacinda Ardern not only deserves to be declared the Person of the Year 2019, but through her exemplary leadership, and decisive prompt action, she has demonstrated through her actions she is the best Prime Minister a country could have and should be nominated for the Nobel peace prize in 2020. On March 18th, at the opening of the first parliamentary session since the Christchurch mosque shootings, Imam Nizam ul haq Thanvi recited verses of the Quran. 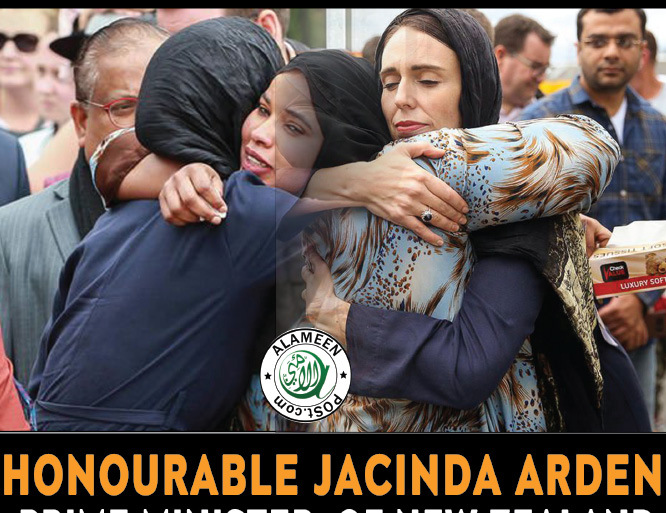 Jacinda Ardern in her opening address to Parliament said "As-salamu alaykum, peace be upon you, and peace be upon all of us." She has done more in these few days than what Muslims and other world leaders could not do. May Allah Accept her efforts Ameen.